Are you looking for a Honda Accord for sale near Orange County, CA? You’re in luck, because we’ve got several trim levels here at Norm Reeves Honda Superstore Huntington Beach. We think this versatile sedan is a great choice for drivers in our area, whether you’re commuting to work, spending a weekend at Knott’s Berry Farm, or heading to Balboa Pier to take the perfect sunset picture. Learn a little more about the Honda Accord and how our team can help you take the wheel for yourself. The 192-horsepower engine also gives you two transmission choices. It comes standard with an efficient continuously variable transmission (CVT) that keeps your performance optimized by providing unlimited shift points between the upper and lower limits. If you want a sportier experience, you can choose the 6-speed manual transmission that gives you complete control over your shift schedules. The 292-horsepower engine merges these two options by pairing with a 10-speed automatic transmission. This gives you the performance and efficiency of an automatic, with additional upper gears to improve fuel economy during highway cruising. However, if you want more control, the Shift-By Wire feature allows you to change gears on-demand with steering wheel-mounted paddle shifters. 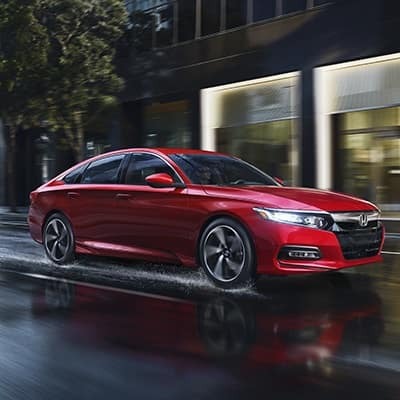 In addition to sporting an impressive powertrain, the Honda Accord also offers several technology features that are especially useful for Orange County area drivers. Available ventilated seats, for example, are very convenient when you get in your car on a hot day. On the road, you can also take advantage of infotainment features like Bluetooth® HandsFreeLink® and Bluetooth® Streaming Audio. These features allow you to wirelessly link your smartphone with your car and make important phone calls on-the-go or stream your favorite music playlists. An 8-inch touchscreen is available in the center stack and includes available Android Auto™ and Apple CarPlay™ compatibility. These fully integrate your favorite smartphone apps with your car, including texting and even navigation. 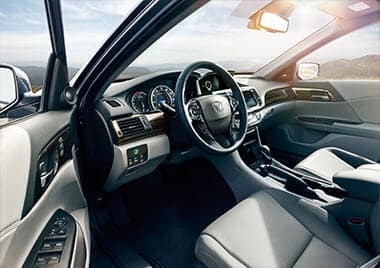 The standard Honda Sensing® Suite is also incredibly useful in helping you stay aware of your surroundings. This suite includes features like Forward Collision Warning and the Collision Mitigation Braking System™. These features alert you to potential hazards up ahead and can even hit the brakes if necessary, to try to avoid a potential collision. When you drive the Honda Accord around Orange County, you have a total of 105.6 cubic feet of passenger volume for you and all your friends, as well as 16.7 cubic feet of trunk space for luggage and other essentials. You can outfit your interior space in either Gray, Ivory, or Black materials. You can also choose between cloth seats, leather, or a sporty combination of the two. 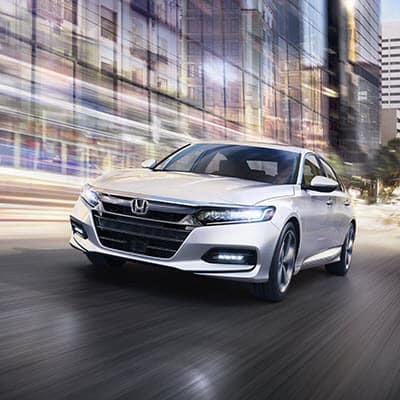 If the Honda Accord sounds like the right car for your commutes through Orange County, CA, stop by our dealership and our knowledgeable team will help you get behind the wheel. This model gives you five trim levels to choose from—LX, Sport, EX, EX-L, and Touring—so take your time deciding which is the right one for you. Our sales professionals will happily take the time to learn more about your lifestyle and match you to the correct trim for your needs before getting you out for a test drive. They can also tell you about any current deals and incentives that may make getting behind the wheel even more convenient. In addition to our new Honda Accord inventory, we have several options in our used and certified pre-owned (CPO) selections. Our CPO models have undergone a comprehensive multi-point inspection and detailing process to ensure they meet our high standards. They also come equipped with a limited factory warranty. Our entire new, used, and CPO Honda Accord inventories are listed online, so feel free to start browsing or contact us to see our selection in-person. When you’ve decided which Honda Accord model you want to drive home from our Orange County area dealership, stop by our finance center to discuss all your financing options. Our finance team will learn what you need out of your next auto loan and help you decide what kind of loan terms work best with your budget. Once you’re ready to go, they’ll reach out to their network of local lenders on your behalf to help you secure an auto loan that works for you. You can get this process rolling by completing our finance application online now. After you and your Honda Accord have spent some time on the road, you’ll want to be sure to schedule your first routine maintenance service—which will probably be your 7,500-mile oil change. When that time comes, remember our Orange County area dealership. We have a state-of-the-art service center on-site where you can come for all your routine maintenance needs. Our technicians are factory-trained and -certified and passionate about providing high-quality automotive service. Whether you’re stopping by for tire repair services, a brake pad replacement, or an engine tune-up, we’ll always use genuine original equipment manufacturer (OEM) parts. You can also order any specific parts you may need through our online order form. When you’re due for service, use our portal to make your next appointment, or contact us directly and we’ll get you on the schedule. 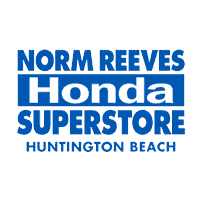 At Norm Reeves Honda Superstore Huntington Beach, we have a Honda Accord for sale near Orange County, CA, that you can take for a test drive. Simply contact us and we’ll help you get behind the wheel.